Senate Armed Services Committee Chair Senator John McCain (R-AZ) spoke about national security issues at a Christian Science Monitor breakfast. Topics included the possibility of the U.K. launching airstrikes against ISIS* in Syria, closing Guantanamo Bay, and the presidential campaign. The Islamic State of Iraq and Syria (ISIS), the Islamic State of Iraq and the Levant (ISIL), or DAISH/DAESH in Arabic is a militant group that has called itself the Islamic State. 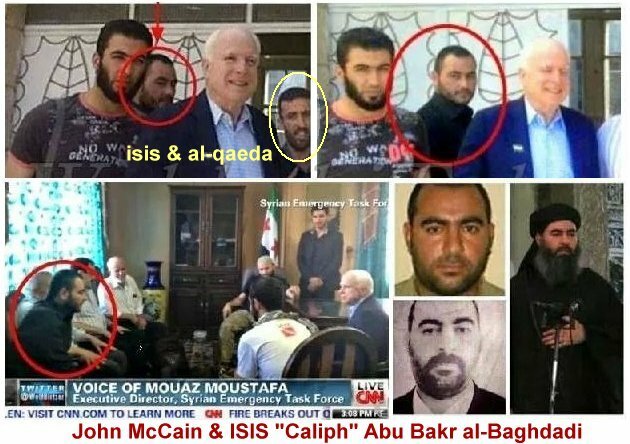 For many of those who do not know already John McCain has often been viewed in many photos with head ISIS leaders who at the time were the moderate rebels he and the U.S. were arming and funding to take down the Assaad Regime in Syria. John McCain has shown an outstanding history and connection to ISIS. A video was hacked from one of his staffers, revealing a studio production of the James Foley beheading, which is confirmed from a side by side analysis. One has to ask, with the connection he has was he or did he know who was directly responsible for the highly orchestrated (attacks) in Paris? Who is this special somebody he is referring to? In addition, most recently relating to the San Bernardino Shooting, one of the alleged shooters, Syed Farook was a supporter of al Baghdadi.